Writing is messy. Writing does not mean mean knowing what you want to say before you say it. If that were true, I would never writ. I never know exactly what I am going to say or how. It's the surprise of writing that makes it exciting. As teachers we must help our students and ourselves expect the unexpected. It is through this process that we discover new ways of thinking and knowing. I like to write partly because I love the surprises. 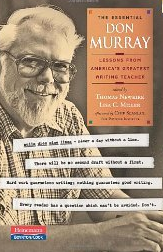 To read more from Don Murray, check out this book - THE ESSENTIAL DON MURRAY. 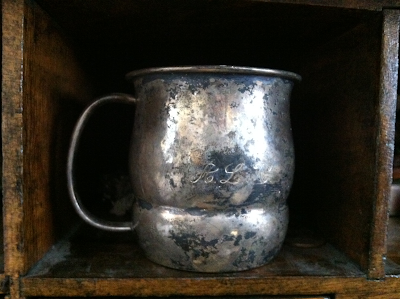 This photo you see is of is my old silver cup, given to me (I think) from my Grandpa Norman. I keep it in one of the nooks of my roll top desk, and every once in a while, I just hold it. Now I feel like polishing it. There are surely more stories hidden in there (Why did my grandpa give me this cup? Did I really drink from it?) and I will need to ask my mom about those. If ever you're unsure of what to write about, you might consider writing from an object. Keep some inspiring beauties and trinkets in your own work space, and who knows...they might creep into your writing. Today's poem is writing in rhyming couplets. Each pair of lines rhymes at the end! You may remember last year's March Madness poetry competition hosted by Ed DeCaria over at Think Kid, Think! Well, things are gearing up again, and you can check out this year's lineup of 64 poets at Think Kid, Think! today. There are a lot of poets we know from Poetry Friday and from last year's competition, and there are some new names too. I did not throw my hat into the ring this year, but I look forward to reading the many poems that grow from these days of poetry madness! Honestly, I LOVED hearing you say that you often do not know what you are going to write about until you start. I think that is something that is hard for so many to grasp....they think they need to know ahead of time and thus they are frustrated. When I was teaching writing and the kids had the old 5th gr test in NY state there was a planning page; the writing process called for pre-writing. So often some thought it had to be some sort of concrete plan when really, the writing often just grows from one word, one idea, one nugget to the next. It is great for kids to be able to hear and see it from you, too. So excited about March Madness Poetry time and hope the interest will spread. I really encourage teachers to give this a serious look!!!! Love this year's authletes but will miss your poems!! Though I know I will find wonderful ones right here at the Poem Farm!! Thanks, Amy. Touching poem, Amy! 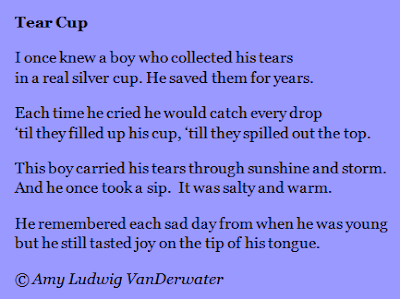 Poignant, yet it brings a smaile at the end. Well done! I'm glad it has a 'joy-filled' ending, Amy. 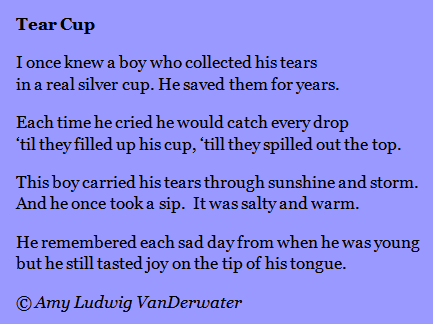 This poem reminds me of one of the Frog & Toad stories where they make 'tearwater tea'-so sweet. Thanks for the ideas about objects-might be a fun activity for a group too.